I was gonna make a podcast commemorating what would have been Garcia's 69th bday and stuff, but wasn't really feeling it. 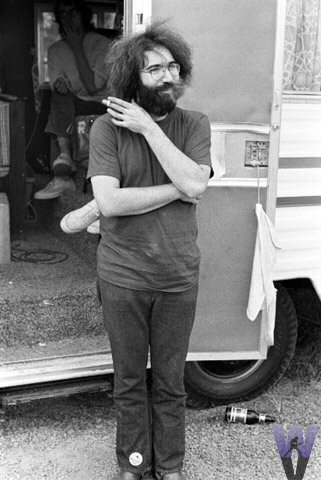 Suffice to say, Jerry Garcia was no lazy hippie. His life is very well chronicled through all the music he played and played and played. His monthly planner (if he kept one) could have included: 3 bluegrass gigs, 10 Grateful Dead shows, 6 club dates with one side project or another, a week of songwriting with Robert Hunter, and rehearsals and recording with all of the above. Phew. In lieu of a podcast, I made a movie (below) AND.... here's a chronological list of 50 great songs he wrote over his career with the Grateful Dead. Besides "Cream Puff War", which he wrote words and music to, the rest are all music by Garcia, words by Robert Hunter. And here's a video I made--A Grateful Dead Noise Collage. Most non-fans associate the Dead with long, noodly jams (mmm...noodles and jam...), however, for their first decade or so, they sure delighted in spending at least a few minutes each show making an awful racket that would impress your average Sonic Youth fan. Have you the stomach to take all 11 minutes?